I thought surely, once the newness wore off a little, and the sleepless nights started to show the true colors of parenthood, that his sentiment would change. It hasn’t. In fact, I think his resolve that we need to have at least one more child, sooner rather than later, has only gotten stronger as time has passed. While I don’t mind the idea of another kid, the problem is, besides my total lack of desire to go through pregnancy, giving birth, and breastfeeding again, Aubrey is 8 months as of today and I am currently in the worst shape physically (and in some ways mentally) that I have been in in years. And the thought of tacking on another pregnancy, and my body spiraling into an even worse physical state, is all but terrifying to me. Appearance isn’t everything, but I know from first hand experience, that at least for me personally, feeling healthy and feeling good in my own skin absolutely impacts my mental health and happiness. I’m trying not to hate my body, and to lovingly accept the new curves and their place in my life for now, but I can’t. Because I know I can do better and be better. Every morning when I wake up and try on a pair of pants that used to be my go-to casual comfy pants, only to find that they are nearly too tight to button, I feel a little bit of despair creep in. Especially considering that before I left the hospital I was already below my pre-pregnancy weight, so what I am dealing with now has all happened postpartum. I’m not disillusioned, and I realize that I had a baby, and that simple thing alone takes a huge toll on your body. But at the same time, I realize that in the big picture, I’m only about 7-10 pounds away from where I want to be. It’s like being able to see your prize, yet it’s only just out of your reach. Looking back now, I realize that I was in the best shape of my life before I got pregnant. Which had been my goal, but I had no idea just how far I had come in my personal fitness journey. And I maintained that fitness pretty well up until week 35 of pregnancy. 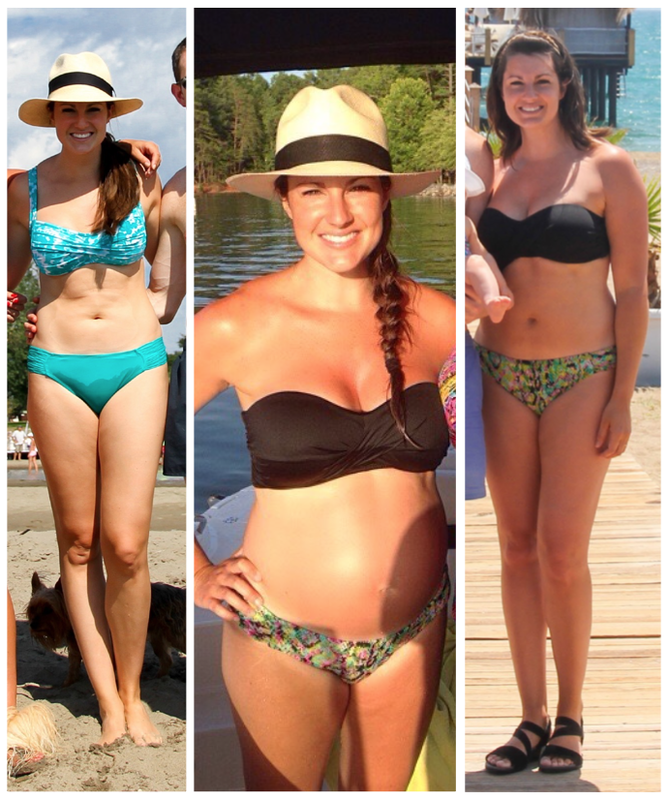 The summer before I got pregnant, 6 months pregnant, and 7.5 months postpartum. So why don’t you do something about it? I’m sure you are asking. The short answer is, I’ve tried but can’t. The long answer is I haven’t had the support system (read: friends and family to babysit) that I’ve needed to make working out consistently a possibility. Aubrey’s nap schedule fluctuated so much in the first 4-5 months that I couldn’t depend on it enough to be able to plan to take her to a babysitter’s house so I could make the crossfit class at the gym. I had to choose between a happy baby, or a screaming baby so I could in a workout (during which I usually stressed nonstop about said screaming baby). In the end I couldn’t deal with going to pick her up and finding her in complete distress. And there wasn’t anyone who was able to come to our house to watch her. So working out was tabled. The two times I’ve gone home to the states our family has been so great about watching her every day so I can go to the gym. And I was so pleased to find that instead of it being a hard first step to get back into it, getting back into the groove working out regularly was like riding a bike. And then we came back to Turkey and it all came to a halt again. My only other option was working out at home. And this is where I only have myself to blame. Since getting into crossfit, my idea of a good workout involves lots of heavy weights and intensity. It also means spending an hour doing something total selfish and forgetting everything outside of the gym. Working out at home doesn’t provide either of those, and generally doesn’t feel worth it. Which I know is a poor way to think about it, because in reality every little bit helps. And now I’ve let myself fall so far down that that realization is finally starting to set in. When it comes to food, although we always eat fairly healthy, I’ve hidden behind the idea that I could eat more (which I often translated into whatever I want) because I am breastfeeding and need to keep up my supply. At this point though, Aubrey is only nursing four times a day, and the truth is, I don’t need the extra calories now. So Will and I took the first step last week when we returned from vacation. We acknowledged just how far we had slipped in our normal diet, and rebooted. And friends, it has been a struggle for me. Not necessarily cleaning up our eats, but more so getting my portions, snacking, and sugar intake under control. We’re on week two, and although I haven’t noticed any changes in my weight yet, I will say I’m feeling a bit better about the eating choices I’m making. The next step is finding my way back to fitness. We are leaving soon for a nearly month-long trip through Europe with mine and Will’s families. I’m secretly hoping the sheer amount of walking we will be doing will be of some help, but in general working out is once again being put on hold until we get back. Aubrey is now at an age where she can be awake for a pretty decent amount of time, and her naps are fairly regular. So fingers crossed that I can find someone to watch her for an hour a few days a week, I think I finally have the resolve and determination to make fitness a priority again. I need it for my happiness, my sanity, my self confidence. I need it so I can be a better mom for Aubrey, and a better wife to Will. And I need it to once again prepare my body for possibly growing another little one somewhere down the road. So this post doesn’t really have much of a point, but is rather a mental dumping for me, but I would love to hear your experiences with postpartum fitness. What worked? What didn’t? How long did it take you to get back to what you would consider a good place? Any tips and advice, or general good luck is SO welcomed! When you feel well and fit in yourself…you're fit enough to face another pregnancy. I race on my bicycle…and when I felt ready to race, I was fit enough to deal with a pregnancy ( I have four kids,youngest one 26 on Saturday).